Pesto is the word around here this summer, or pistou or pestare whichever you prefer. We’re going to grind up a lot of good stuff to make delicious sauces with bright, healthy flavor. Most of these sauces will be flavored with garlic. There are many varieties of garlic out there, all of which seem to be very easy to grow. I love that it gets planted in October when many of the other garden chores have subsided. Garlic likes the cool fall to set down roots and when spring arrives, your first crop is already in for an early summer harvest. 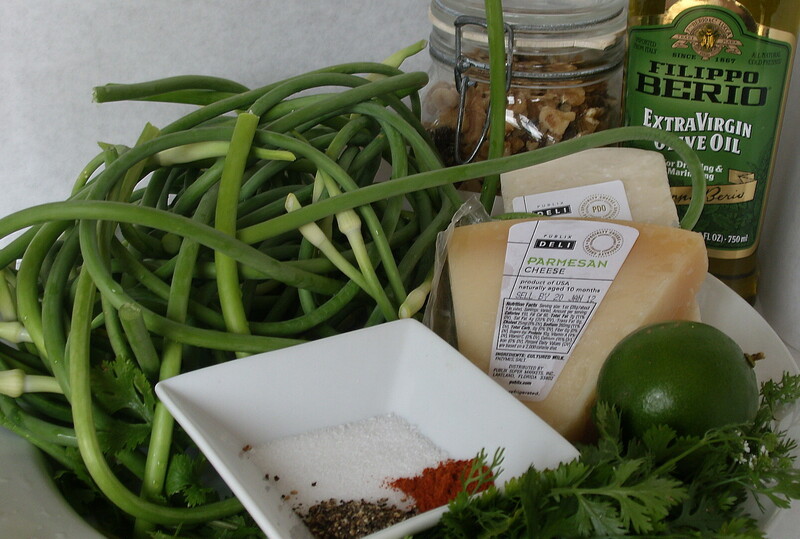 I’ve got all kinds of ideas beyond the traditional basil/garlic/pine-nutty varieties of pesto. The key is flavor. It’s vibrant and summery and can be tailored to any cuisine. This year, I will save some pesto for the winter months by freezing it. 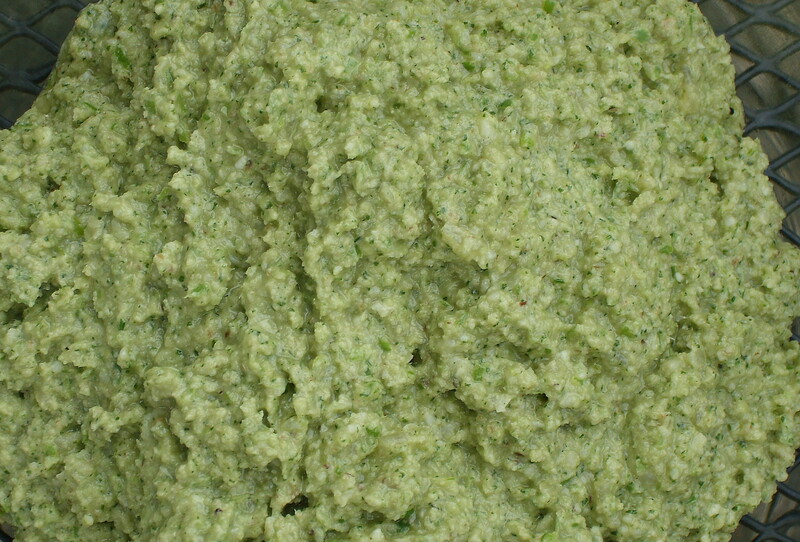 I plan to experiment with freezing pesto in ice-cube trays to thaw for dressings; in wide mouth mason jars for soups and stews or as a pizza/focaccia sauce and also large batches in freezer bags for pasta sauce or a quick hot or cold potato salad. My first pesto of the season utilizes garlic scapes, which come from the hardneck variety of garlic as flowering stems that shoot up in the spring. For the bulbs to keep the energy and mature into garlic cloves instead of making seeds, the scapes must be broken off before they flower. For us, this happened right at the end of May and early June this year. Almost overnight we noticed curling stalks in comical ringlets winding around as if confused, looking for the sunshine. We intervened and found quite a bounty! Note: break off or cut the scapes and wait to harvest the hardneck varieties until the bulbs are ready, up to several weeks. In the picture above Jack has harvested some softneck (the type you find braided) garlic. 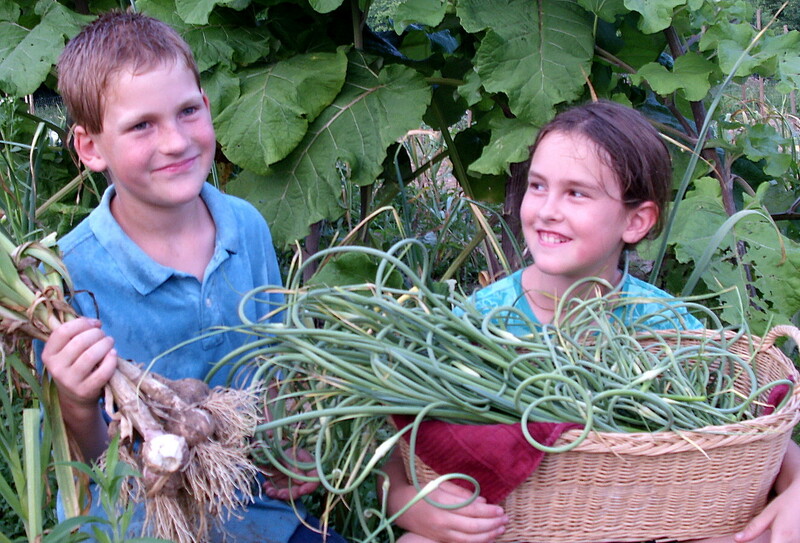 The kids enjoy harvesting both scapes and garlic. I knew garlic scapes had good culinary use and flavor but had no idea how delicious they could be as a substitute for garlic cloves in pesto. I will grow hardneck garlic next year for the scapes alone! This year, we planted Rosso di Sulmona from GrowItalian.com. The Viola Francese has always been my favorite because I like large purplish cloves and the flavor is wonderful but when I planted the Rosso seed garlic, I could tell this would be a keeper. The cloves were smaller and firmer with a nice reddish color, I also liked the pungency and the more assertive garlic flavor. I think it might hold up a little better in marinara or other sauces that cook a long time. With all of those scapes, I decided to make pesto. My recipe is adapted from this article. It is still somewhat early in the season so the basil isn’t yet bushy, but with the heat, the cilantro is starting to fade so I opted to use cilantro; you can use parsley or basil or a combination of several different types of herbs depending on your ultimate flavor goal. You can make pesto with multiple herbs including dill, oregano, sage, fennel, marjoram, thyme, mint, etc., you get the picture. There are no hard and fast rules, be creative! 2 cups Garlic scapes flowers removed and chopped into small pieces. Pinch salt, pepper and cayenne to taste. Put all ingredients in food processor fitted with the metal blade and add olive oil slowly as you process it. Stop adding oil when the pesto is the consistency you desire. This is a great blog. My wife and I really enjoyed reading it. It is a both a family friendly status site and place where helpful info is published; recipes and such. We tried the pesto sauce recipe and loved it. We didn’t follow the recipe exactly; we swapped the pecorino with locatelli romano. hope that is OK. My taste buds thought so. If my wife and I ever start a family, we’re gonna look to pink guitar farm for website/blog design inspirations. Thank you for checking out the site! We’re glad you enjoyed the content and are very excited that you tried the pesto recipe. Nice to hear about locatelli romano substitution, sounds wonderful! We encourage creativity with food; using what you have on hand, prefer, or is in season – it’s what makes cooking so fun. Stay tuned for continued updates about family life at Pink Guitar Farm.